The OpticSpy modules provide a platform to explore, evaluate, and experiment with optical data transmissions. They capture, amplify, and convert optical signals into digital form that can be analyzed or decoded with a computer. All designs are distributed under a Creative Commons Attribution-3.0 United States license. Using an Arduino Uno with external LED to send a secret message via optical covert channel. 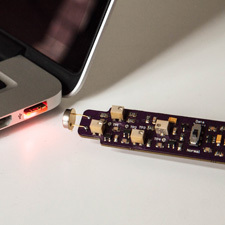 Using the Propeller-based Hackable Electronic Badge to send a secret message via infrared LED. The LCD displays the message being transmitted. Using Tomu’s red LED to send a secret message via optical covert channel. Using the router’s WAN LED to exfiltrate data via optical covert channel. As a proof-of-concept, the payload is loaded onto the device with known administrator credentials. Using the MacBook Pro’s keyboard backlight LEDs as a proof-of-concept optical covert channel. OS X modulates the LEDs at 100Hz, 75% duty cycle, which prevents the use of a high data rate and presents a noticeable flicker when data is being sent.